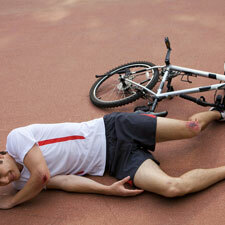 What Should I Do After a Bike Accident? It is extremely important that you follow some basic rules beginning at the scene of the bicycle accident, so you do not jeopardize your health and your right to compensation. Stay at the scene of the bicycle accident and wait for a police officer to come and make a full report of your accident. The existence of a police report will strengthen your case. Seek medical attention immediately. Obtaining a complete examination from a doctor as soon as possible will serve two purposes. First, the doctor can often detect injuries that you may not have noticed until several days after the accident and will be more easily treated if caught early; and second, a doctor’s examination will automatically create a complete medical record of any injuries you sustain during this accident and this will strengthen your case. Get complete information from everyone at the scene of the bicycle accident. Obtain the name, address, telephone number, driver’s license number, and insurance information of all of the drivers involved in the bicycle accident, as well as the names of any emergency personnel and the contact information of any witnesses. 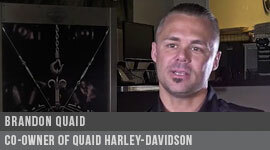 Do not admit guilt or sign any statements without talking to a lawyer first. Be cooperative with the police, other drivers and emergency personnel at the scene of the bicycle accident, but don’t say anything that can later be used as evidence to prove that you were responsible for an accident that wasn’t your fault. Take photographs of your injuries and damage to your bicycle. These photographs work best as evidence when they are taken at the scene of the bicycle accident, but they can also be taken after the fact if you are severely injured and need immediate hospitalization. Keep complete records of medical expenses and other costs related to your accident which can be used as evidence to help you verify these damages. If you have automobile insurance, you may be covered for your bicycle accident as well. Contact your insurance company and report your accident in order to verify whether you have any automobile insurance coverage that would apply to your bicycle claim. Make sure you give this information to your insurance company with an attorney’s assistance at the time you give the statement in order not to prejudice your claim. Your own insurance company is in the business to make money, they are not there to assist you no matter how nice they may seem. They are looking to find ways to getting out of paying you the compensation you deserve-don’t be one of their victims! Do not panic. Remain calm and call for help. Do not discuss the accident with anyone but the police and your attorney. Do not speak to anyone from the at-fault party’s insurance company without an attorney. Do not sign any papers from an insurance company or agree to a settlement without an attorney. Do not wait. Contact Susan Handel immediately. Can you Trust an Insurance Company? Susan Handel’s reputation is distinguished by excellence and compassion. She has the knowledge, experience and resources to handle the most complex cases involving catastrophic injuries and wrongful death claims. 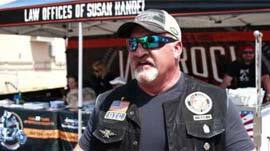 You can count on Susan Handel to get the superior results you deserve. 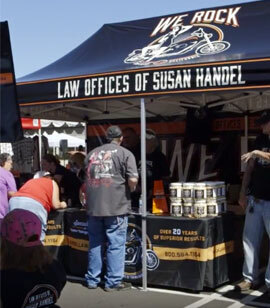 Susan Handel is a regular contributor to the Wheels of Grace Motorcycle Magazine. Click here to read some of her articles.